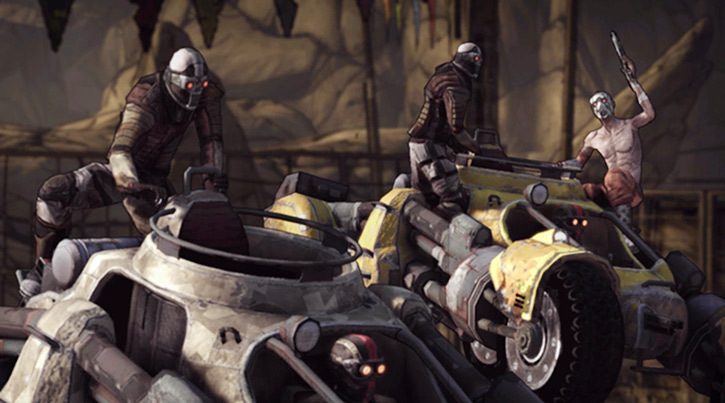 These guys are stock enemies in the original first-person shooter video game Borderlands. 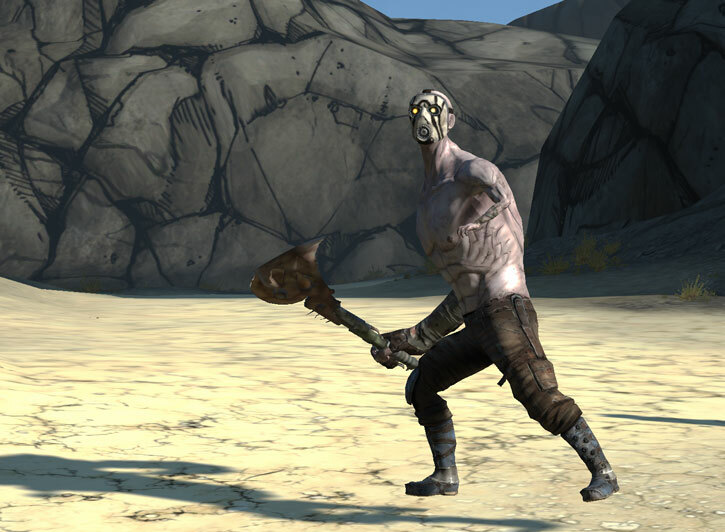 For an introduction to the Borderlands setting, read our Lilith profile first ! Though many of these base, barmy brigands are just blokes with guns, some of them are mutated and have minor powers (without being “bosses”) and distinctive looks. 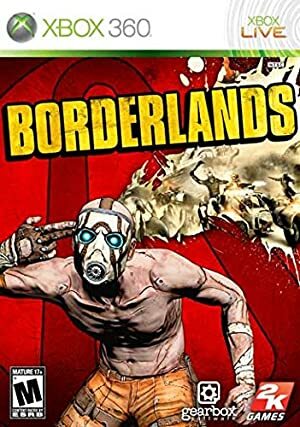 At this stage this only covers the first Borderlands video game. This profile features tabletop RPG mechanics about the video game’s gameplay – see our video games writeups FAQ for more. This profile features non-canon hypotheses about in-game events and mechanics – see our video games writeups FAQ for more. The ample wilderness of Pandora is dominated by innumerable bandit gangs of various sizes. The stronger the leader, the larger the gang. Bandits are not always well-armed (some may just have a pistol), but it’s not uncommon for them to have assault weaponry, grenades and orb shields. After all there are only three abundant goods on Pandora — dust, mud and guns. 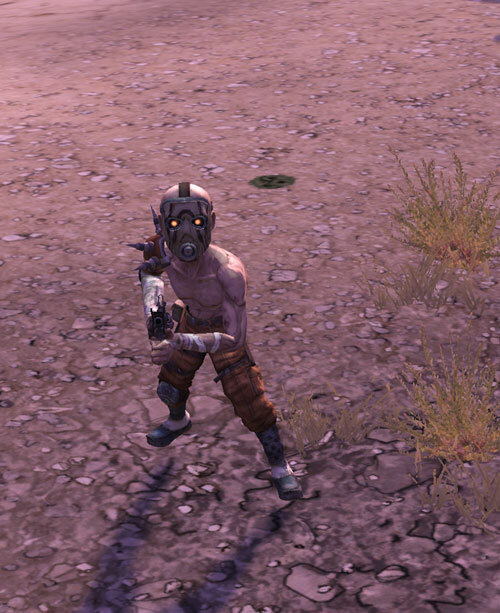 Most bandits on Pandora are apparently convicts who were brought there by the Dahl Corporation to serve as slave labour in their lucrative mining operations. 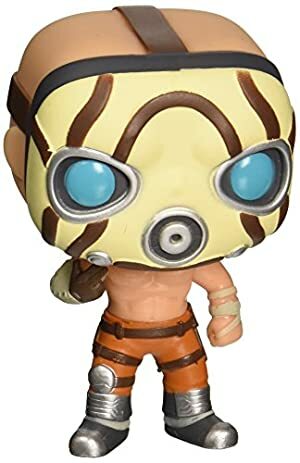 When these were discontinued, Dahl simply abandoned the convicts on site, resulting in an explosion of banditry not too long before the beginning of the first Borderlands game. Other personnel such as overseers, pilots, scientists, etc. were also left behind to cut costs. Living in Pandora, particularly outside of a viable community such as New Haven — which, despite being a giant landfill, gets close to “viable” by the dismal Pandora standards — is detrimental to both body and mind. Insanity claims the mind of many people living in the wilderness, and those with this form of cinematic schizophrenia and murder addiction are simply called “psychos”. 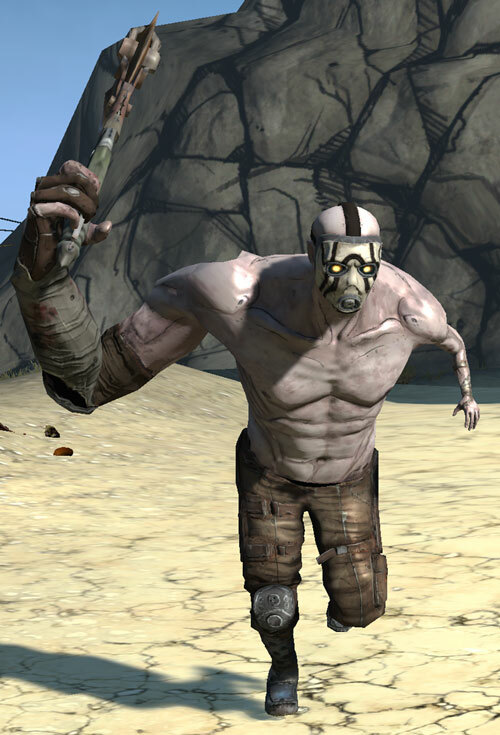 Bodily deformations likewise abound, and many bandits have become either dwarfs or hulking musclebound brutes due to their exposure to the rare mineral Eridium in Dahl mines. Given how damaging life on Pandora is, it is entirely possible that most people end up being bandits sooner or latter as they crack and drift into the badlands. Since there are next to no resources on the planet — despite the local ecosystem not currently being in one of its years-long hibernation cycles — and all convicts were men, the bandits have to raid or die. Their population is thus presumably diminishing from day to day. Minor Psychological Instability, Minor Rage. It’s usually quite mixed – about half will have just one gun and maybe some armour, but the other half may have better guns, better armour, orb shields and/or grenades. Firearms. Pretty much anything from our Modern Firearms articles would work, really. These articles also cover grenades. MASK [BODY 02, Shade: 01, Sealed Systems: 02, Limitation: Sealed systems only to protect against airborne agents]. 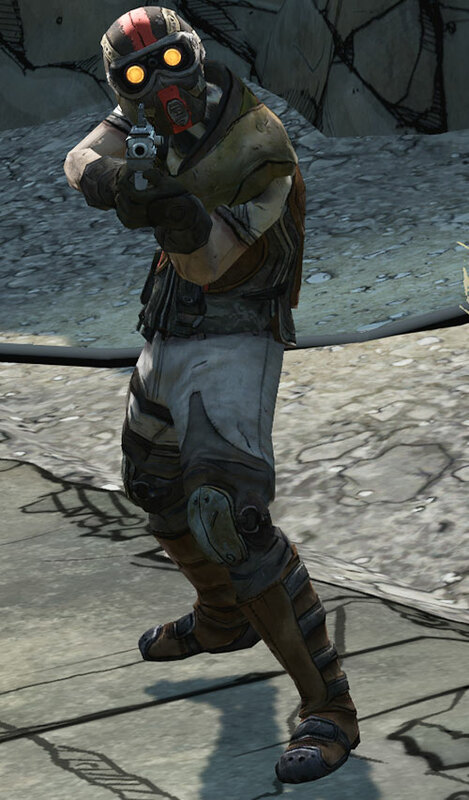 Almost all bandits wear such masks so as to operate on Pandora. BODY ARMOUR. If the bandit is genuinely armoured, 2 to 5 APs of Damage Capacity are likely. ORB SHIELD [BODY 02, Damage capacity: 4 to 8, Skin armour: 2 or 3, Advantage: Damage Capacity regains one AP of Current Condition at the end of every Phase where the character has not been hit by an attack, Limitation: Skin armour only vs. fall damage]. Eridian-charged ammunition. Some bandits may have a gun firing those. Add 4 or 5 APs of Acid Touch, Flame Project, Lightning or Mental Blast. All these have No Range but ride the weapon’s Range and get Combined with the weapon’s attack Power. “Psychos”, as the name suggest, have gone completely insane. They have a dismal self-preservation instinct, are obsessed with cannibalism, and have a fixation on the Vault – often adorning their gear (usually a protective mask) with its Eridian symbol. Psychos do not use guns – they charge in with a buzz axe. These are buzz-saws mounted axe-like on a handle, and given how many bandits have them one imagines that these were Dahl mining tools. Psychos are very good with these (Weaponry (Buzz axe): 05)) and they have [BODY 04, Claws: 07, R#02]. Psychos also suffer from a Catastrophic Rage. 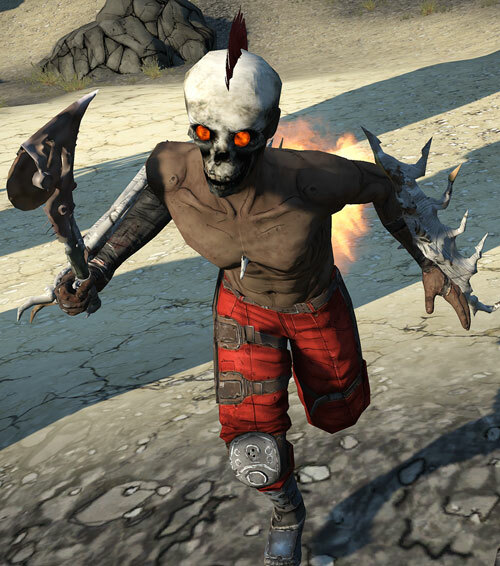 Some psychos are mutated enough to channel Eridian flame energy. They can set themselves on fire when excited, and are fireproof (Flame being: 02, Flame immunity: 04). It is possible that psychos who channel corrosive or electrical Eridian energy also exist. Some psychos also carry several hatchets, and can hurl these at an impressive range [BODY 02, Projectile weapons: 03, Grenade Drawback]. Sometimes one will run at an opponent and pull the pin on a high-powered grenade [BODY 01, Bomb: 09, R#02], possibly also taking other bandits with him in the large ensuing explosion. Among the most memorable psycho battle cries are “Strip the flesh ! Salt the wounds !”, “Time to pound some meat puppets !”, “More meat for me !” and “Time to pay… for another pound of flesh !”. 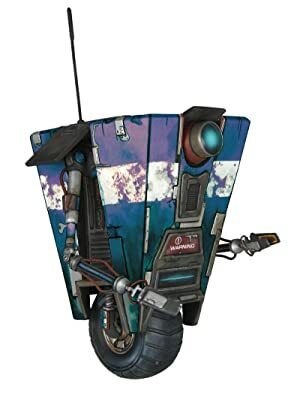 My favourite from BL2 is “Bring me a bucket, and I’ll show you a bucket !”. 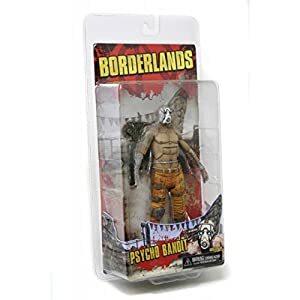 A burning psycho attacks with a buzz axe. 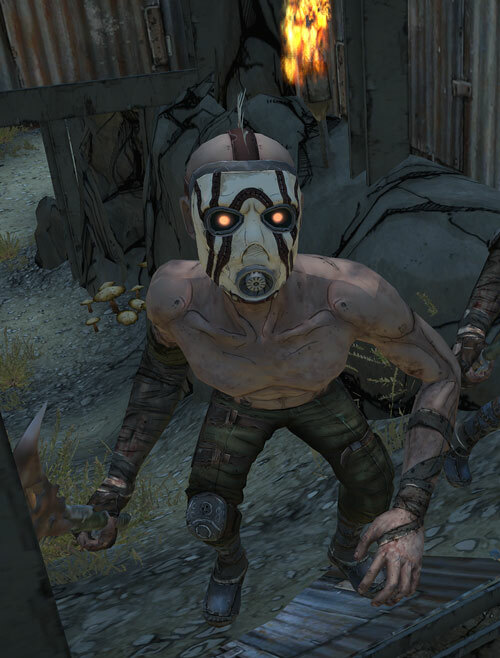 “Midgets” are simply bandits mutated by Eridium exposure to a smaller stature. This is mostly cosmetic – dwarf bandits aren’t really harder to hit in the game in most circumstances, they have the same movement speed as everyone else, etc. Just set their STR to 01 due to lower body mass and add an MPR (Dwarfism). Psycho midgets. Just like the baseline kind, though they are even less coherent and many don’t really talk – they mostly shriek and giggle in an incoherent, damaged manner. Shotgunners. On the plus side, these are always equipped with a shotgun and an orb shield. On the minus side, firing their gun knock them off-balance, and they must spend a full Phase getting back on their feet and reorienting. Their accuracy when taking the shot isn’t diminished, though, thanks to the video-game-grade buckshot dispersion. Skag riders. Dwarfs in the T-Bone Junction area and perhaps elsewhere have somehow tamed skags and learned to ride them in battle. 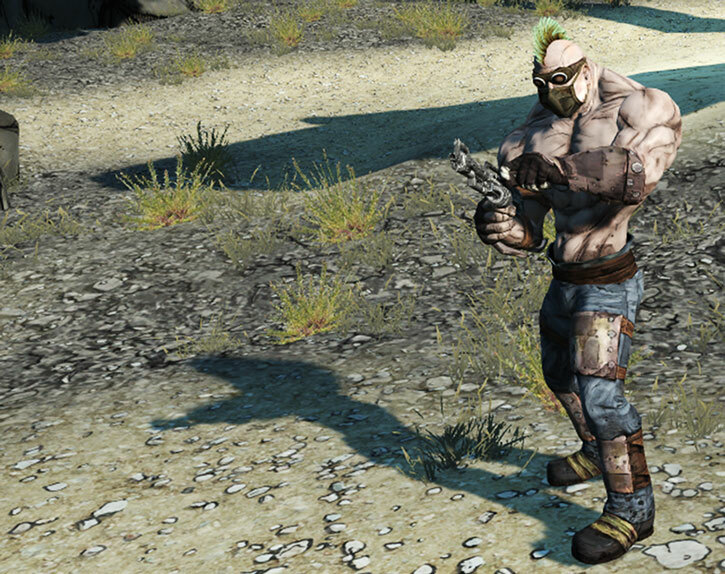 See our article about skags, but note that some dwarfs add jerry-rigged body armour on their skag (about 5 APs of Damage Capacity). Ravagers. These throw bundles of dynamite with a lit fuse (EV 08, Area of Effect 0 APs ; they have an AV of 03 with it) and carry quite a few of those. On one hand these guys are pretty rare so that’s good ; on the other hand those in the game also ride a skag. The game also features two dwarfs dressed like Truxican wrestlers (which is basically a lucha libre uniform and mask). These guys have 15 HPs, and have a boxing glove with EV 06 – it can send people flying. So yeah, they’re pretty tough. “Bruisers” are also mutated by Eridium, but they are huge and develop a superhuman muscle mass (think Zangief). Bruisers seem to be musclebound – they lack agility, flexibility and coordination. Whether they can even crouch is uncertain, and in combat they can’t really use cover. However, they can take a lot of punishment. Most bruisers operate some kind of machine gun, forcing opponents on the defensive as they hose lots of bullets in the right general direction. A few bruisers operate a reloadable rocket launcher instead. A squad automatic weapon, the equivalent of a BAR, or a light machinegun would be common (see our Weapons Locker articles). A few have reloadable rocket launchers, say [BODY 02, Projectile weapons: 09, Ammo: 03, Drawback: Long reload time]. Some bandits operate fast attack vehicles stolen from the Catch-A-Ride transportation network. This is mostly the province of the gang run by Mad Mel, in the Dahl Headlands. These outrider buggies have [STR 05 BODY 06, Running : 06, R#03] and a pintle-mounted LMG [BODY 03, Projectile weapons: 07, Autofire]. In practice the LMG has an AV of 02 when attempting to shoot something less than car-sized, unless the buggy is at rest. A typical crew will have a driver, a gunner and a boarder. A typical FAV on Pandora. A few bandit clans operate much heavier combat trucks, a model called the Cheetah’s Paw (how bandits spell that is another matter, since they’re functionally illiterate). Paws have a front-mounted machinegun and a turret-mounted rocket launcher operated by a gunner. Truck [STR 07 BODY 08, Projectile weapons: 07, Running: 05, R#03, Note: Projectile weapons can only shoot on what’s in front of the truck] and Turret [BODY 04, Projectile weapons (Area of effect 0 APs): 09, R#04]. In both cases the effective AV of the weapons is 02 unless the truck isn’t moving. There may be a third bandit aboard. A typical Cheetah’s Paw on Pandora. 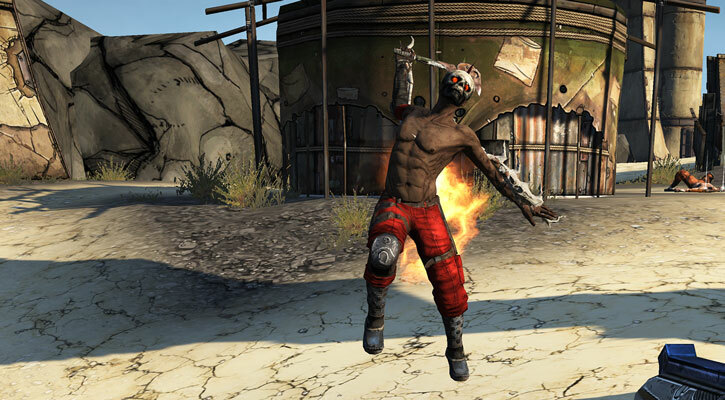 In Borderlands parlance a “badass” is a larger, fiercer, much more durable specimen among a given type of opponents. As a DCH rule of thumb, increase STR by 1 and BODY by 2, raise all Skills by one, assume higher-end equipment for the type, raise the weaponry’s EV by one, and add 20 HPs that can only be used for Last Ditch Defense. They will also look like something out of a 1980s speed metal album cover. The most distinctive badasses are the badass psychos. These are even larger than a bruiser, and are unusually misshapen with a huge right arm and a tiny left arm. 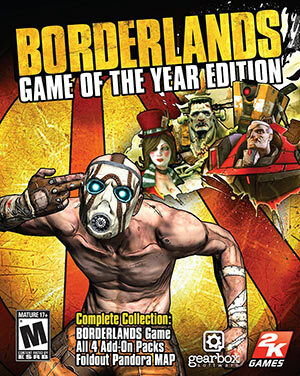 Source of Character: Borderlands video game. 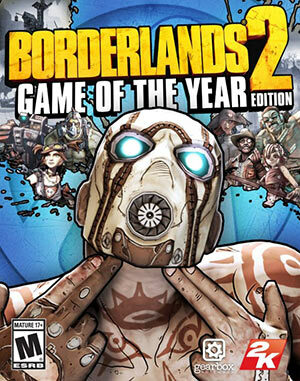 This entry only covers the first game in the series ; the article will be expanded to add bandits from BL2. Writeup completed on the 9th of August, 2014.